Actuated by any underwater noise. These are laid on the sea bed usually in shallow water and are actuated by a magnetic field, noise or a change of pressure or any combination of these. They can be difficult to locate after a long period of time as they can be moved from their original seeding positions by strong tidal currents. This type of mine is connected by a cable to a control station on land and is triggered from the station. Such mines are used only in harbour defense. Actuated by the residual magnetic field inherent in the ship's hull. Moored mines are attached to the ocean floor by an anchored cable and float just below the water's surface. These explode on contact. The contact mine contained anywhere from 300 to 500 pounds of high explosive, was dropped to the sea sea bed along with a minelaying carriage. 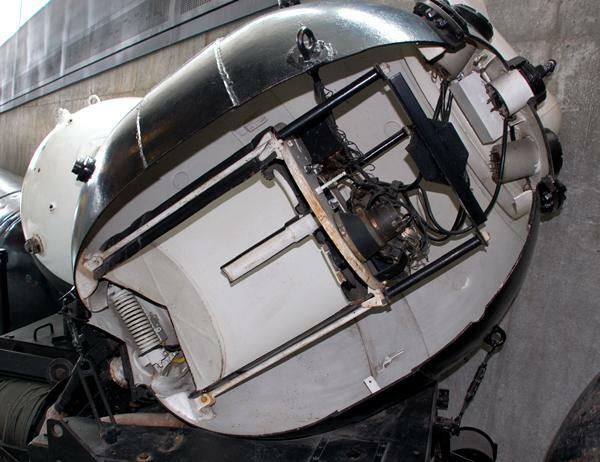 When the carriage struck bottom, a hydrostatic valve which controlled a ratchet mechanism, released a sufficient amount of cable so that the mine floated just beneath the surface at the desired depth. To detonate the mine, a ship's hull would only have to bend one of the lead encased horns. Essentially, the horn was carbon-zinc battery but without any electrolyte and was inert. When the lead horn was bent, a glass tube broke and released a bichromate solution which made contact with the carbon and zinc plates thus creating electricity. This electrical current then flowed to platinum fuse wire in a fulminate of mercury solution (primer) which detonated the mine. More often than not, most of the damage to the vessel would be confined to the bows area. Activated by a change in hydrostatic pressure caused by the passage of a ship's hull. Some safety can be expected by a very slow passage but don't count on it. Primitive naval mines were used, unsuccessfully, during the American Revolutionary War, when beer kegs filled with black powder were floated down the Delaware River against the British fleet (January 1778). Mines containing both explosives and a detonator were first used during the Crimean War. Until about 1870, the terms mine and torpedo were interchangeable. Admiral Farragut's defiant statement "Damn the torpedoes and full speed ahead ..... " at Mobile Bay in 1864 referred to mines that had been moored in the bay. 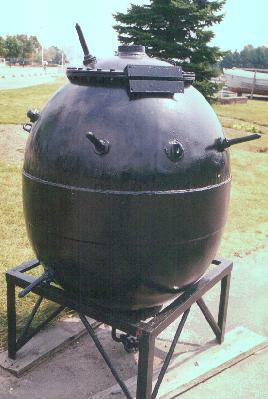 Naval mines were widely used in World War I, when Germany mined the entrances to British and American ports. In turn, the Allies mined the approaches to the North Sea and the harbours used by German submarines. When an object collided with the mine, contact horns were depressed, shattering chemical-filled glass tubes within. This action released chemicals that mixed, thus producing an electric current that activated a fulminate-of-mercury detonator. This in turn, fired the main explosive charge. In 1942, researchers in the UK developed the acoustical hammer box. It consisted of a electric hammer or road drill fitted inside a steel conical box, which when operated, made sufficient noise to detonate an acoustical mine at a safe distance from the minesweeper. The box was mounted on a boom over the minesweeper's bow and was raised and lowered as required. This variety of sweep was designated by the British as the SA Mark II (acoustical) sweep. SA Type A Mk II - Kango Hammer in a conical steel box fitted on a hinged boom over the sweeper's bow. SA Type A Mk III -two Kango hammers fitted internally, one on each side, held up against a steel diaphragm 24 inches in diameter, in a flooded forepeak. SA Type A Mk IV - Spring hammer in a towed box, towed from a short boom amidships or boat davit, becoming the standard SA sweep in new fleet sweepers, BYMSs, and MMSs from end of 1942 onwards. SA Type A Mark V - Spring hammer towed as above, but using a device to push the box away from the ship. SA Type B - Probably early experimental type, no data available. SA Type C Mark I - Fessenden oscillator, fitted internally. It was fitted inside the stem in a flooded forepeak. The diaphragm was of 26 inches diameter. Used in destroyers and some sweepers up to 1942. SA Type C Mark II - Two Fessenden oscillators, fitted internally. One was fitted on each side of the stem in a flooded forepeak, same size as previous, Fitted in some large warships and a number of destroyers up to 1944. SA Type D Mark I - A modified Kango hammer towed overside in a steel box, experimental type not in production. SA Type D mark II Pipe noisemakers, towed over side, resembling the "Foxer" noisemaker towed astern against acoustic-homing torpedoes; discontinued early. SA Type D Mark III - another version of experimental pipe noisemaker; discontinued early. SA type E - hand grenades thrown over side indiscriminately. SA Type F - The use of machine gun bursts in the water, surprisingly successful! SA Type G - Spring hammer in a steel box, but this time towed from the LL tails (that is noisemakers added to the towed sweep cables which carried an electric current, used to generate a magnetic field to trigger magnetic mines. First trials were conducted aboard HMCS Standard Coaster in 1942 and several units were operational in Bangor mine-sweepers by the end of that year. During the mid 1940's, Haida was fitted with Type C MkII Twin Oscillators for acoustical minesweeping (SA) and were located in the forward structure. Another system for minesweeping was known as LL. The LL sweep consisted of two unequal lengths of buoyant cable trailing behind a minesweeper. These cables were powered by a series of pulsating electrical charges which in turn induced a magnetic field strong enough to fire the mine. Naval minesweepers also tow special cable cutters called paravanes through mine-infested waters. When the mooring cable is severed, the mines then rise to the surface where they can be exploded by gunfire. André Guibert provides some additional insight into WWII era minesweeping. " Moored or contact mines were swept by a paravanes from two ships that had fairly shallow draft. If its wings or the tow cable snagged, the cable securing the mine and the paravane would be brought together and the mine exploded harmlessly. The cable could then be retrieved and a replacement paravane fitted. Alternately, cable cutters triggered by the pull of the anchoring cable would sever the cable and the mine would float up. Acoustic mines were triggered by noise making towed gear. Magnetic mines were triggered by a towed coil spread out by paravanes. The coil was fed by a DC pulsed generator capable of producing a 1000 amps for the loop current. The pulses would activate a counter inside the mine. Many magnetic mines did not explode on the first passing of a ship. Instead the passing of ship simply incremented a counter which would then fool a ships captain into believing a channel was safe. When the target number set in the counter was achieved, the mine blew up. The ships involved in magnetic sweeping had to be positioned over a control grid to evaluate their magnetic field strength and characteristics in order to know how much power to apply to the various degaussing coils spread inside the ships. There was also a correction chart for different latitudes. Shipkeeper Jim Brewer describes the method used to degauss HMCS HAIDA. "Haida has a permanently installed degaussing system. It consists of two circuits.The one in the forward section comprises of three cables, each containing 21 wires, running along the inside of the hull, just above the waterline. The wires are connected in series to form a giant coil of 63 turns. A direct current supply is supplied to this coil which produces a magnetic field that opposes the inherent field in the hull. There is an identical system in the aft end of the ship except that there are only two cables of 21 wires each are installed. The tricky part is lies in the ship's magnetic compass. When the degaussing was turned on, the little coils on compass were energized in such a manner to make the compass think it was still in the ship's inherent field". Some aircraft such as the Wellington (Wimpy) was also equipped with a loop for the destruction of magnetic mines. Power was supplied by a Ford V8 motor. These aircraft had to fly at some minimum altitude in order not to be swamped by the blast". Mine warfare has also become a good deal more complex and sophisticated since World War II. Magnetic, acoustic and pressure- triggering mechanisms operating singly or in combination, have become sufficiently sensitive for mines to be laid in much deeper waters. 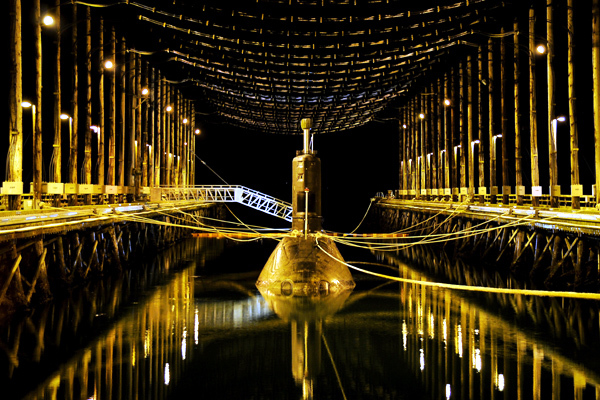 They remain easy to lay -- from aircraft, surface vessels, and submarines but they are becoming harder to sweep or hunt. The increase in their effective depth has greatly widened the areas over which they can be seeded. Moored mines, including those laid in fairly deep waters can be swept more easily than acoustic and magnetic ground mines. By far, the most difficult devil to deal with is the pressure mine that must be exploded one by one. Various techniques exist to cope with them, including divers equipped with hand-held sonars, remote control vehicles, wooden or plastic hulled mine-hunting vessels or specially equipped helicopters. Pressure mines present a particularly nettlesome problem because they slow down naval operations considerably. Not only must they be approached at very low speeds, but locating them requires examination of a large number of pieces of metallic debris that can be found on the sea bed. It is estimated that 15 to 20 minutes are required to process each contact. "Mines are a very cheap and effective way of disrupting maritime operations and they can be laid by very unsophisticated vessels. The effectiveness of mine warfare was aptly demonstrated in the Korean War when the North Koreans mined the approaches to Wonsan using old Russian mines laid by fishing junks, thus preventing the landing of the U.N. amphibious force for many days. The commander of that operation, Admiral Smith of the United States Navy, reported: "I have lost command of the sea to a nation without a navy, using weapons which were obsolete at the time of World War 1, delivered by vessels which were obsolescent at the time of the birth of Christ". Some of the newest mines, however, can be laid at a depth too great to be reached by a minesweeper. The French have developed a wire-guided, television-equipped submersible mine-finder (Outfit PAP) that can place an explosive charge next to a mine, but the device cannot operate below depths of 300 m (1,000 ft).